WARNING: There is not a witch, ghost, or pumpkin on any of the fabrics in this "Halloween" quilt. If that does not suit your fancy, turn back now. I just finished this quilt last night. The only fabrics I had to buy were for the outer border and binding. The rest came from my stash. The pattern for this quilt came from the book called, Folk Art Quilts: A Fresh Look by Sandy Bonsib. I've made quite a few quilts from it, including this and this. A few years ago I met a blogger that had made this quilt up in Halloween fabrics and I knew that I wanted to do that too. The outer border fabric is called Halloween Night Dot in Black Orange from the line, Halloween Night by Minick and Simpson for Moda. The binding is called Awesome Cross Hatch in Pumpkin from the line, Awesome by Sandy Gervais for Moda. I had no idea how labor intensive it would be to sew them on, but I endured the 3 hours it took me to sew them into the binding [I think anyone else could have done them a lot faster. I think I'm just really slow.] And p.s., they wash up well. However, I think they shrink because my quilt is not laying flat...don't know what to do about that. Anyways, more scraps on the back. Can you see the spiderweb quilting design? Kayleen Parry in Lehi, UT. did a fantastic job quilting this for me. Since I don't have any "Halloween" prints in my stash I decided to bring in the spiderweb design in my quilting (just to spruce things up a bit). Neither the house blocks or the fabrics are "Halloweeny" so I thought it needed just a little something that screamed "Halloween". It's perfect Amber! I'm inspired to do something much like yours! Thank you! Oh my gosh Amber!! That is so cute! How fun is that.....just wonderful! Really cute! I noticed the web quilting right away, it really adds to the quilt. Great job! So very festive! I love all the polka dots you incorporated into the quilt. And the moon, too. :) Loving it! It is great. I love the spiderwebs. Great job! Ambs, it's adorable! That quilting is fabulous, and I especially love the pom pom's. Great job! Cute! Congrats for making it almost completely from your stash! The pom poms would have driven me crazy I'm sure! And that is does Amber..screams YOU>..
piece be with you and all that Halloweenie stuff.. Very cute! I really like it and so simple to make. That is a really really cute quilt. I'm going to have to give up the internet. My list of quilts to make get longer every time I log on! And I'm not getting any younger here! Love the spider web, it certainally makes the quilt. great job! Very Cute! I love that you didn't use actual halloween fabrics. And I'd never thought about washing the pom-poms -- it's good to know that they launder well! Amber your quilt is adorable. I'm not really into scary witches and Halloween fabrics, so your houses are just perfect in my book. 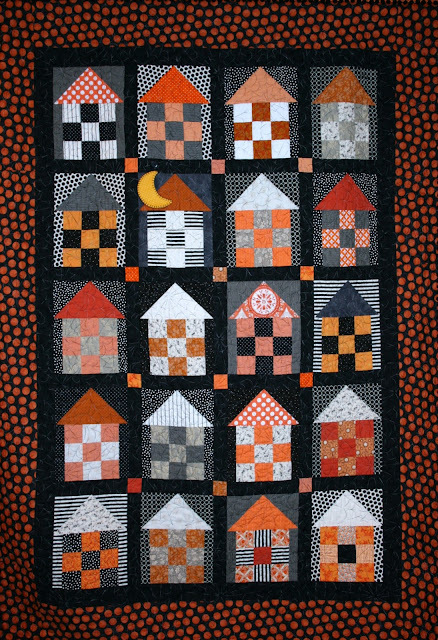 I love to make house quilts and your moon reminds me of an outhouse block I made awhile back. I love your quilt, and the quilting is amazing!